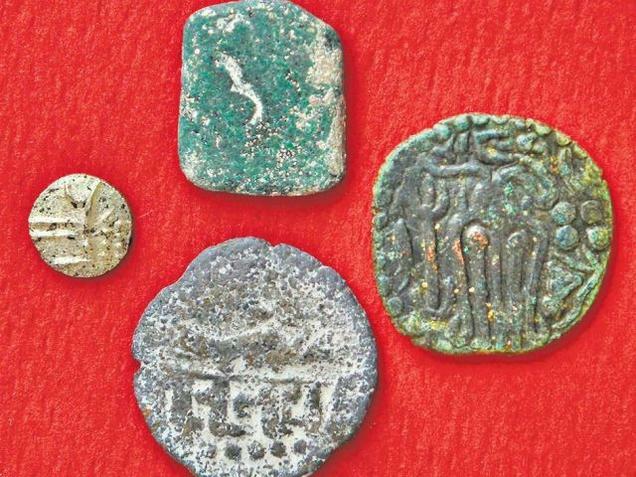 Ancient coins found during excavations at Senthalaipattanam village in Thanjavur district. Ten coins including a Sangam age Chera coin datable to circa second century BCE, eight Chola period coins and a Vijayanagara period coin have been found in a trench excavated by Tamil University, Thanjavur, at Senthalaipattanam, Thanjavur district. Of the eight Chola coins, one belongs to the emperor Raja Raja Chola (regnal years 985 CE to 1014 CE) and another to his son, Rajendra Chola (regnal years 1012 CE to 1044 CE). The other coins are being cleaned. The miniscule Vijayanagara silver coin was issued by emperor Krishnadevaraya. Three trenches — two at Senthalaipattanam and one at the nearby Mandripattanam — have yielded gold core, glass beads, micro beads, potsherds and a terracotta pipe for transporting water. Both Senthalaipattanam and Mandripattanam are coastal villages. The trenches are five metres by five metres and half a metre deep. The excavation is being done by the Department of Maritime History and Marine Archaeology of Tamil University. The Director of Excavation is S. Rajavelu, Dean, Faculty of Manuscriptology. What led them to choose this site for excavation was that when the shore was dug up on this stretch about 15 years ago to set up prawn farms, several Sangam age, Roman and late Chola period coins were found. The Senthalaipattanam trench yielded the Chera lead coin of second century BCE. It has the image of a bow on the reverse side and the obverse probably has a carving of an elephant. “This kind of Chera coin is generally found [on the surface] in the Karur region in Tamil Nadu. This is the first time that we have found it in a trench in an excavation on the eastern coast,” said Dr. Rajavelu. Of the eight copper coins of the Chola period, one was issued by Raja Raja Chola. It has the image, on the obverse, of a man standing and holding a flower. The reverse shows a seated man and a legend in Nagari, reading “Rajaraja.” This type of coin is called “Eelam Kasu” (coin). The coin issued by Rajendra Chola has the Nagari script “Uttama” [Chola], his grandfather’s name, on the observe. The reverse side is not clear. The Vijayanagara coin has a seated goddess on the obverse, and a leaf with horizontal lines and dots on the reverse. While the Chera coin was found at the lowermost level, the Chola coins were found above and the Vijayanagara coin at the topmost level. The excavation yielded a heap of beads made out of glass, terracotta and semi-precious stones, terracotta pipes and big pots. There are several lakes with fresh water in the area. “The findings confirm that Mandripattanam must have been a port-town during the pre-Christian era and a naval base to load the ships with food and water during the Chola period,” Dr. Rajavelu said.